Cantonese opera is a distinctive form of opera originating in the region of Guangdong and Hong Kong in southern China. Above is a scene from the famous 1981 movie, Bai Ga Jai (which in English has been translated as Prodigal Son), in which the character portraying Master Leung Yi-Tai explains to the character portraying the young Leung Jan (both of whom are historical kung fu masters of Wing Chun kung fu who lived during the 1800s in Guangdong) some of the strict traditions observed by the actors participating in Cantonese opera -- specifically the traditions involving the portrayal of General Guan Yu (or Gwaan Dzyu in Cantonese, sometimes spelled as "General Kwan"). Leung Yi-Tai: He is forbidden to speak! Leung Yi-Tai: When he wears this makeup and costume, he takes on the role of the god. He will be punished if he speaks. Leung Jan: Why so many regulations? Leung Yi-Tai: We must observe them. The one who plays General Gwaan must first take a bath before taking on the role. After his performance, he must burn money to the gods, in order to show respect. He cleans off his face-paint with incense paper. Then the spirit of the General will leave him. Now he can speak again. The above discussion takes place starting at about 26:20 (just after Leung Jan attempts to speak with General Gwaan and is ignored). Unfortunately, the version available on YouTube, embedded above, is dubbed in Mandarin (or Putonghua) rather than the original Cantonese (Guangdonghua). You can order the original film in Cantonese with English subtitles if you do some searching on the web. Cantonese opera, of course, is traditionally performed in Cantonese (Guangdonghua). As the above-cited scene makes clear, the actors in some cases are actually thought to be inhabited by certain spirits from the divine realm once they are in full costume. Indeed, it is thought that all Chinese opera descends from ancient rituals done to please the gods in order to invoke blessing upon the people and to prevent any displeasure or punishment from the realm of spirit. See for instance this thesis paper written by Liu Hsueh-Fang of the Rochester Institute of Technology in 1997, which says that the origin of the elaborate face-paint of Chinese opera is thought to trace its origins back to masks used in ritual performances in ancient times. This connection between ritual drama and the realm of the gods also manifests itself in the loud music played in conjunction with the performances, including cymbals, pipes, flutes and drums, as well as in the stylized movements and hand gestures which are very distinctive aspects of Cantonese opera. Even to this day, the connection between the opera and the divine realm is observed, and it is understood that even though mortal men and women come to watch the operas, the performances are actually observed by the gods and are done for their benefit. For instance, this article from 2009 recounting a visit to a Cantonese opera performance as well as insights from an opera performer says that, "Since the deities are the intended audience, the human audience can talk or even eat and play games like mahjong and chess while the opera is going on without insulting the performers." This article from 2014 provides additional detail, including descriptions of some of the rituals and associated prohibitions. It notes that performances are sometimes paid for by businesses in order to appease the spirits and prevent their displeasure. The book Improvisation in a Ritual Context: The Music of Cantonese Opera, by Professor Chan Sau-Yan (1991), provides even greater insight and detail regarding the ritual aspects of Cantonese opera. It explains that ritual opera has traditionally been performed at three different times of the year: during festivals (or "nodes," one of which is discussed here), at the observance of the birthdays of deities, and at special rituals of purification (pages 5 and 6). For some ritual operas, temporary halls are constructed for the performance, in which there are no seats for human audience-members: "People understand that such operas are staged chiefly for the deities and ghosts" (6). It is extremely noteworthy that the actors in Cantonese opera actually retain the understanding that they are taking on the spirit of a god when they play certain roles, once they have put on their makeup and costumes and burned incense to the deity. In addition to the ritual bath mentioned above regarding the preparation to take on the role of General Gwaan (or General Kwan), there is a tradition mentioned in other sources that actors in Cantonese opera traditionally must put on their makeup themselves -- or, if they have help, the one who helps them must strictly obey the direction of the one who is taking on the role. There is also the tradition of a line known as the Hu Du Men (which in Cantonese would be Fu Dou Mun) described in this page of this website on Cantonese opera from the City University of Hong Kong. The phrase is written 虎度門 in Chinese characters and they signify (in order): "tiger" "barrier / limit" "door / gate." Of this concept we are told that Hu Du Men is a term used by professionals in the opera business to describe an imaginary gate or barrier separating the ordinary world from the stage area where performance takes place: "Once the actor passes the back stage and proceeds to the front stage, he has to leave himself behind and get himself totally absorbed in his own character." I would argue that these surviving traditions in Cantonese opera provide vital insights into an ancient practice which appears to have once been worldwide: the performance of ritual drama in which actors or participants take on the role of the gods or spirits. We can observe the wearing of masks in conjunction with such drama in accounts from ancient Greece and Rome, but also in many other cultures around the world, including the Indigenous nations of the Americas, and of Africa, and of the islands of the Pacific. Intriguingly, the sacred Kachina tradition of the Pueblo nations of the Hopi and the Zuni appears to exhibit striking parallels to the Cantonese opera. In Cantonese opera (until recently), men played the roles of both male and female characters on the stage -- and this is true of the Kachina traditions of the Hopi and the Zuni as well (it is also notably true of Shakespearean drama from the early modern period of the 1500s and 1600s in England). The Kachina rituals depict the powerful spirit-beings of the Kachina themselves, but some performers also portray clowns -- which is also true of Cantonese opera. (Left) Kachina doll depicting a Koshari. Wikimedia commons (link). 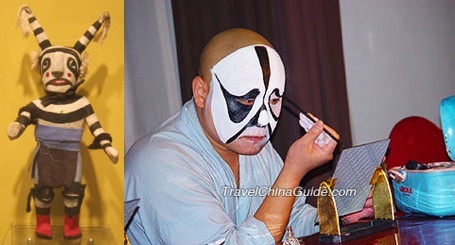 (Right) Actor in the Beijing opera putting on traditional black-and-white face paint design (link). The similarities to the traditions of the Cantonese opera described above are remarkable, the more so because there is not thought to have been any historical contact between the ancient Native American nations of the Hopi or the Zuni and the ancient culture of China. Even if one were to admit the possibility of some sort of ancient contact between China and the Americas (which may well have taken place), it would stretch credibility to argue that such transoceanic contact is also responsible for the masked sacred drama of ancient Greece, or of Africa, and so on around the globe. The world-wide prevalence of ritual drama and dances, almost always utilizing masks and also similar types of music and percussion, on every continent and island of our planet argues that this pattern may be far more ancient, and may descend from some common predecessor culture or cultures, just as the world's ancient myths share striking similarities and a basis in celestial metaphor -- similarities too specific to be convincingly explained as "coincidental development in complete isolation," and yet too widespread across both geographical distance and also across millennia to be easily explained by cultural distribution during conventionally-acknowledged history after the rise of the civilizations of ancient China, ancient India, ancient Egypt, and ancient Mesopotamia (especially since the celestial myth-patterns are already present in the earliest known texts from those civilizations). Indeed, I believe that it can be shown that there are connections between the ancient rituals and dramatic traditions performed for the gods (and for the benefit of the people) and the ancient myths and scriptures which "dramatize" the motions of the heavenly actors in order to convey truths about the Invisible Realm to men and women in this incarnate life. In the tradition of Cantonese opera, for example, opera professionals worship and pay respect above all to Hua Guang 華光 the Fire God, including by performing operas on the day that his birthday is observed (which is usually said to be on the 28th day of the Ninth lunar month, which corresponds to the fifth of November this year on the Gregorian calendar). Legend has it that Wah Kong was sent down from heaven by the Jade Emperor to burn down the opera stage as the latter was angry with mankind for insulting deities and immortals by depicting them in their performances. But Wah Kong forgot about his mission as he was engrossed with the performers' acting. He even stood in to play a percussion instrument when the actual percussionist failed to deliver on stage. The deity had a change of heart about destroying the opera stage. Instead, he advised the opera performers to burn incense to create thick smoke. When the Jade Emperor saw the billowing smoke, he thought that Wah Kong had carried out his command. The deity had spared the lives of the mortals with his clever plan. The Jade Emperor never found out the truth. Hence, opera performers pay tribute to the deity because he not only saved their lives but taught them how to play percussion. Longtime readers of this blog should instantly recognize that this myth is remarkably similar to the origin story of the Lantern Festival of China, which was discussed in this blog post from March of 2015. As that post explains, the Lantern Festival commemorates a time when the same Jade Emperor planned to rain fire down upon the people of the world because they had, in their ignorance, killed his favorite beautiful bird. The Jade Emperor's beautiful daughter heard of her father's plan, and sent word to the people in order to warn them. A wise old man came up with the idea of lighting lanterns in every village and town, so that when the Jade Emperor and his heavenly army looked down from the heavens, they would see what looked like a river of fire already blanketing the earth, and would not feel the need to rain down fire. As that 2015 post explains, this story almost certainly has celestial origins, with the heavenly bird probably represented by the constellation Aquila the Eagle in the band of the Milky Way galaxy -- and the Milky Way galaxy itself often playing the role of a column of fire or of smoke in many myths around the globe. 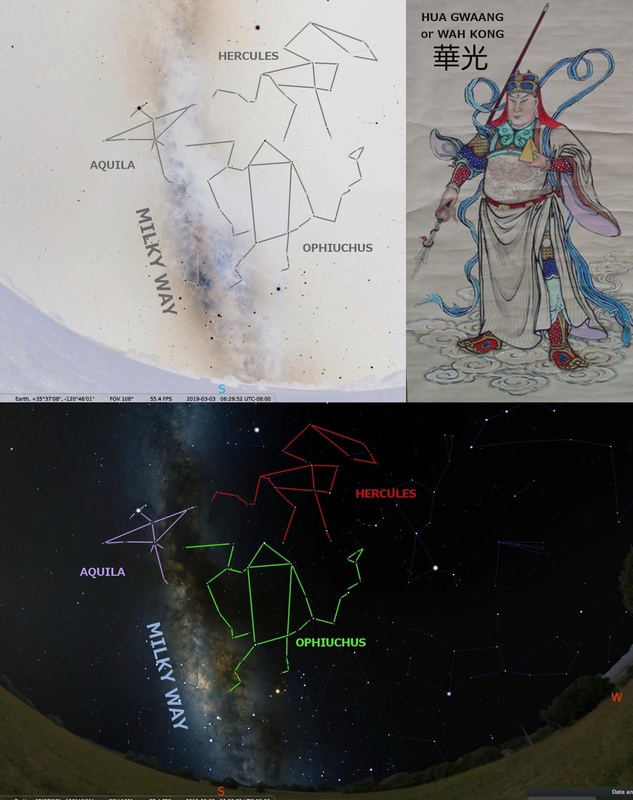 That 2015 post argues that the Jade Emperor is probably associated with the constellation Bootes, and his daughter with the constellation Virgo, although with the benefit of a few more years and of the extensive research for several more books on the world's Star Myths since that blog was written, I would suggest that it might be more likely to identify the Jade Emperor with the constellation Hercules, since Hercules is closer to the Milky Way, while still close enough to Virgo for Virgo to play the Emperor's daughter (Sagittarius could also play the Emperor's daughter, if he is associated with the constellation Hercules). Given the apparent propensity of the Jade Emperor to threaten to rain fire from the heavens, an identification with Hercules seems to be the most likely. As for the god Hua Guang, I believe that he is almost certainly to be identified with the constellation Ophiuchus, due to the fact that he is depicted as holding a small pyramid shape, carries a long spear, is depicted with a "third eye" (see the triangle-shaped head of the constellation Ophiuchus, discussed here and here), is sometimes accompanied by a "fire crow" (which would be Aquila again, located beside Ophiuchus in the midst of the Milky Way band -- which represents a column of smoke or of fire in many myths), and is said in ancient Chinese myth to be descended from a god with a square head (which would be Hercules, located directly above Ophiuchus -- which is why Ophiuchus figures are often said to be "descended from" Hercules-figures). Note small yellow pyramid in his left hand, corresponding to the triangular shape on the right side of Ophiuchus as we face the star-charts. Note also the small serpent depicted winding around the tip of the spear held in the deity's right hand (corresponding to the left side of Ophiuchus as we face the sky or the star-charts). From all of this discussion, we can be very confident that the widespread tradition of ritual drama and the world-wide system of celestial metaphor underlying the ancient myths are closely related and probably descended from the same now-forgotten source, predating the earliest cultures and civilizations known to conventional history. In a sense, both serve the same purpose: to make visible to us the Invisible Realm, and to impress upon us the importance of acknowledging the gods and their influence on this apparently-material realm in which we find ourselves. Even more powerfully, they both tell us the message that the gods actually manifest themselves through mortal men and women, a message which has been discussed in numerous previous posts, including here, here and here. Those traditions which have managed to survive down through the millennia and to preserve some of this ancient wisdom, such as the traditions which survive within Cantonese opera described above, as well as in the ongoing Kachina rituals of the Zuni and Hopi nations in North America, provide us with incredibly significant windows into that ancient wisdom, given to men and women in some remote period of antiquity, and which should be seen as a precious inheritance from the realm of the gods -- and one whose lessons are as vital and necessary to our lives today as they have ever been at any time in the past.